Although Sufi shrines have frequently been the targets of terrorist attacks in the entire country, the Pashtun regions (consisting of Khyber Pakhtunkhwa, the Pakistani tribal areas, and adjacent regions in Afghanistan) have witnessed a significant rise in such attacks in the last five years. In the most recent attacks, Taliban targeted the shrines of Sufi saints Sheikh Nisa Baba and Sheikh Bahadur Baba in Khyber Agency on December 11. They also killed the caretaker of the shrine of another saint Baisai Baba in the same tribal agency. At least 56 people were killed in a suicide attack at the gate of Abul Fazil’s shrine in Kabul, Afghanistan, on December 7. All the victims were Shia mourners and a majority of them were children. Sufism has a deep influence on the Pashtun society and a large number of Sufi shrines dot the landscape of Pashtun dominated areas. Sahibzada Amir Muhammad, a Kabul-based Sufi preacher, claims that although suppressed by the Taliban, Sufism is re-emerging in Afghanistan. “Thousands of Arab militants who arrived in Afghanistan under the leadership of Al Qaeda’s Osama Bin Laden brought with them foreign ideologies, especially Wahabism,” he said. Wahabism’s hard-line interpretation of Islam sees Sufism and its practices as un-Islamic. During the five-year rule of the Taliban, many Sufis and their followers were compelled to go underground or abandon their faith, he added. The December 7 attack comes despite orders by Taliban supreme commander Mullah Omar not to attack civilians, and indicates Al Qaeda-linked militants are not under his direct operational control. Security experts and Sufi leaders in Pakistan also link the attacks on Sufi shrines with the arrival of Arab militants in Afghanistan and their alliance with Afghan and Pakistani Taliban. A large number of madrassas funded by donors in Arab countries are also seen to be in conflict with local Sufi Islam. The Taliban see the attacks on shrines and other cultural symbols as attempts at constructing a new culture and a new identity. The attacks began many years ago with Tehreek-e-Taliban Pakistan and Lashkar-e-Islam’s targeting of tombs of great Sufi saints in Khyber Pakhtunkhwa and FATA. The shrines of Hazrat Rehman Baba, Abdul Shakoor Malang Baba, Hazrat Abu Saeed Baba, Mian Umer Baba and Malang Baba were attacked and desecrated, while that of Hazrat Sayyad Ali Tirmizi, commonly known as Pir Baba in Buner, was locked. The mausoleum of famous freedom fighter Haji Sahib Tarangzai in Mohmand Agency was captured and converted into Taliban headquarters. Soon the militants also started targeting shrines in urban Pakistan. These attacks were timed and planned to kill as many devotees as possible. More than 25 shrines across the country have been attacked since 2005, and 200 devotees have been killed. In July 2010, the shrine of Sufi saint Data Ganj Baksh Hajveri in Lahore was attacked by two suicide bombers. At least 45 devotees were killed and dozens others injured. A suicide attack on the shrine of Sufi saint Abdullah Shah Ghazi in Karachi killed another nine people in October 2010. An attack on Baba Farid Shakarganj’s shrine in Pakpattan in October that year left another seven people dead. 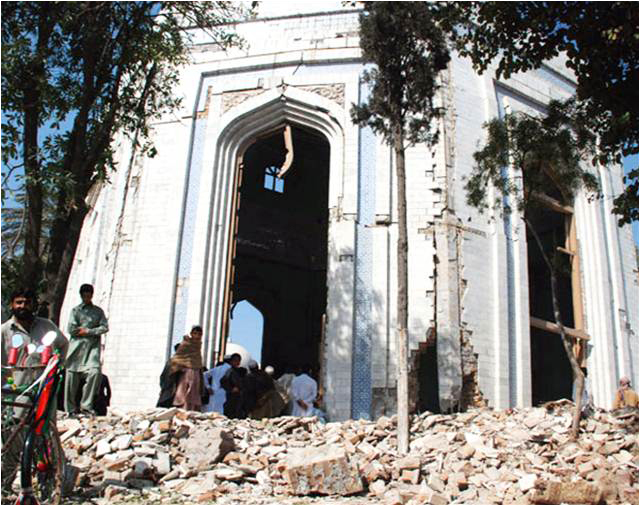 The March 5, 2009 attack on the mausoleum of Rehman Baba, a revered Pashto Sufi poet of the 17th century, was widely condemned in both Pakistan and Afghanistan. Thousands of people visited the shrine after the bombing. Many were seen weeping. A day after the attack on Rehman Baba’s tomb, the shrine of another revered spiritual figure, Bahadur Baba, was targeted by missiles. Almost all attacks on shrines in Khyber Agency and Peshawar have been claimed by Lashkar-e-Islam, a Khyber agency-based militant group that follows Deobandi and Panjpiri creeds. Pir Noorul Haq Qadri, an adherent of Sufism living in Landi Kotal, has been elected from Khyber Agency twice, although most locals belong to the Deobandi school of thought. “That clearly shows that Pashtuns respect the adherents of Sufism and have nothing to do with the attacks against them,” a local tribal elder said. Qadri’s three close relatives – brother Humayun Qadri, cousin Nooruddin Qadri and uncle Abdul Azeem Qadri – were killed by militants on April 21, 2008. Their graves were desecrated.